be going to school in DC. Under ACA can I have her plan be in both states? I can’t let her father put her under his plan because she is my financial dependent. You have a few options. The first one is we can look to see if there is a plan in zip code that has regional or national coverage, allowing her coverage in both DC and NYC. If we are unable to, we can look for a plan in DC for the school year, and NYC for the summer. The best way to figure this out is to call one of our Medicoverage licensed independent insurance agents at 800-930-7956. I am 27 yrs. old and am presently working on my PhD in Michigan. I am still a NYS resident. My school will no longer allow me to purchase health insurance through them. Therefore, as of Aug. 2016 I am in need of health insurance. I do not make a tegular salary…only a stipend of $8000 for 2015. You have a few options. You can 1) Get an Obamacare health plan quote for NY, and apply for a plan that has regional and national coverage, without subsidies, 3) If a plan a regional or national plan is not available, you will apply for a plan in Michigan while you’re there for the school year, and a plan in New York for the summer, 2) Apply for Medicaid (since your income would not give you premium subsidies), 3) Get an ACA Catastrophic plan, or 4) Because your income is so low, you can apply for an exemption. My daughter will be 26 in February and needs to get own insurance. She is going to school in New York but permant residence is in Minnesota. With her income low she would qualify for free insurance in Minnesota but New York will not take her mnsure insurance. Can she get medicaid in New York even though she files taxes in Minnesota. Thank you for your question. They may allow students who have non-permanent residence to enroll in a plan in their area. She will want to contact New York’s Medicaid to see if she would qualify. If she doesn’t, tell her to call 800-930-7956, and we would be happy to help her with a health plan. I have a primary residence in Maryland and have Medicade under the Medicaid expansion in Maryland. We file married filing separate tax returns. Can we file joint tax returns next year and, if the income and household size qualify,can my wife purchase MarketPlace insurance with a Premium credit? Could I still keep my Medicaid coverage in Maryland if the income qualifies for a household size of two,if she lives in another state? Thank you for your question. We suggest you contact your tax expert on your specific case. Best of luck! We completely understand your confusion! Trying to find a plan that offers coverage in more than one state, makes you want to pull your hair out. If you give us your zip code and county we’d be able to see if any plans offer regional or nationwide coverage in your area. At this time, I don’t see a multi-state plan offered in Florida. However, plans can change up until Obamacare Open Enrollment begins. 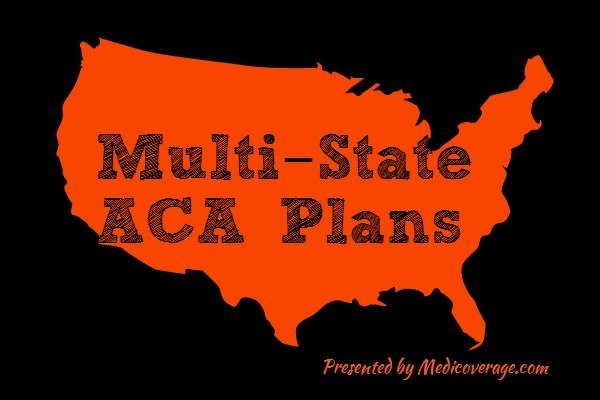 Remember that multi-state does NOT mean necessarily mean you are covered in more than one state. Other non “multi-state” PPO plans can offer regional and nationwide coverage. If you call a Senior65 agent, we can help you learn if/which plans cover you in more than one state. WE ARE SNOWBIRDS WHO LIVE IN CALIFORNIA HALF TIME. MY WIFE IS 62 AND HER HEALTH INSURANCE FROM OUR ‘SUMMER HOME’ IS EXTREMELY HIGH. IM 67 SO QUALIFY FOR MEDICARE. CAN WE BUY AFFORDABLE HEALTH INSURANCE IN CALIFORNIA? apply for Medigap or Medicare Advantage, since you are 67. Please contact an agent at 800-930-7956, so that we can help with your specific needs. I am planning on retiring at 60. We are plamming on moving to the USVI, which is not covered by aca. I also understand that there are no companies offering insurance in the USVI to individuals at this time. Can a person living part time in KY or maintaining their mailing address in KY purchase an aca plan in KY and use it in USVI? If not, is there a plan that will cover KY and USVI that can be purchased. We have pre-existing conditions so we will need a plan that covers that. Thank you for your questions. As far as we can tell, the U.S. Virgin Islands did not participate in creating an exchange; however, it looks like certain companies, like Blue Cross Blue Shield, are selling individual plans. For your second question, you would need to confirm with your tax professional, but, as far as we know you can apply for insurance within the state you pay taxes. Hope this helps. I am a snowbird who as of this year have changed my residency (drivers license, voting registration) from Massachusetts to Florida. I now spend seven months in Florida and five in Massachusetts each year. Of course, I want a plan that covers me appropriately for my split of time each year. In looking at Healthcare.gov, the options seem limited and confusing. What multi-state options exist for my situation? Thank you. Thank you for your question. As a snowbird there may be some plans available to you that offer nationwide or regional networks. Please call us at 800-930-7956, so that an agent can help answer your specific question. My son recently moved home to Boston from CA. We were able to get him insurance coverage through ACA till December 2014. He is now considering going back to school in CA. He is 23 yo and as you can see is not yet settled. Is there a policy we can purchase to be assured he has coverage in CA and MA? Thank you for your question. Most plans available on and off the exchange will only cover your son in the state it was issued in (emergencies are covered in any state). However, there may be some PPO plans that offer a wider network. Contact one of our agents at 800-930-7956 to help you find a plan that works for you. I moved from ct to florida,I recently cancelled my health insurance in ct to purchase one through the marketplace in FL. I finally kept my house in ct, and I m going to live in both state CT and Fl. Can I have a second insurance? Thank you for your question. There are some PPO plans available that offer regional or nationwide networks. However, they are not abundant and may not be available in your area. We suggest due to the specificity of your question that you contact an agent directly at 800-930-7956, so that we may better help you. I need health care for adjoining states, NV and CA. There doesn’t seem to be a problem if you travel out of state, temporarily. But seems to be a problem if for instance you regularly spend part of the year in each state. Many people do this, I am sure. I am currently a kaiser member but it seems that my coverage would be in jeopardy if I did this. So I am looking for alternatives. Regular Medicare would be an option, but I am interested in an Advantage plan if I can find one. If you are under 65 are looking for an ACA plan, please Call 800-930-7956 so that an agent can help you figure out which plan is right for you. Hello. My husband is 66 on Medicare I am 61 and we were a small group with our business. With the new health insurance laws we are no longer considered a group. I need an individual plan. The problem is we spend winters in Florida and live the other time in New York. I understand from my broker that there is no insurance that will cover me in New York and Florida. He says my only option is to get a Travelers insurance plan for my time in Florida. What are your thoughts on this? The highest travelers plan will only cover $100,000 per incident. The other individual plans for New York will cover emergency in other states but very limited from what I understand. Thanks for your question. You are right that all plans offer emergency coverage no matter where you are in the states. As far as your travelers insurance plan it would depend on a few issues. Please call 800-930-7956 to speak to a Medicoverage agent to figure out what is the best plan for you. I am planning to retire within the year at age 62. I will need to purchase health insurance and will live in CT and FL. I would like to know coverage options and costs for health insurance to be covered in both states. Thanks for you question. Since you will retire before you turn 65 you will need to purchase an individual plan. We know how frustrating it can be to find a plan that covers you in two states. Since your situation is unique, please call 800-930-7956 to speak to an agent to find what health coverage is best for you.